for young dressage horses, Feel Free OLD/Bernadette Brune, placed fourth at the German championships and Fantasy, top price auction foal sold for 107.000 euros, he dominates events. 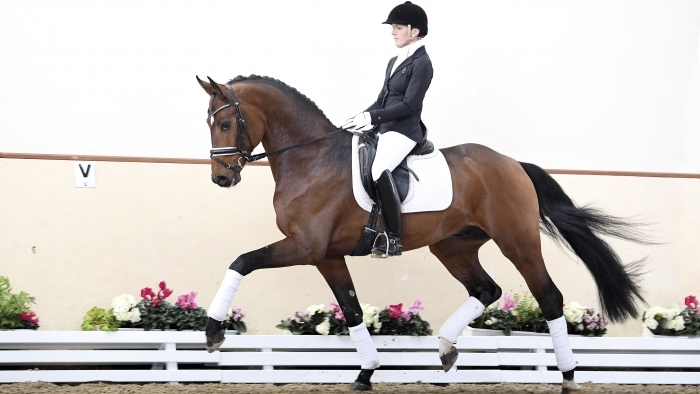 Dam-sire Fürst Romancier was fourth at the World Championships for young dressage horses and at the German championships. Grand dam Gesine also produced the 1st Reserve Champion Vivaldi’s Schufro (by Vivaldi). Sir Donnerhall I, who appears in third generation, has already earned the status of „trademark stallion“. In the fourth generation is Don Schufro, Danish Champion and Team bronze winner at the Olympic Games in Hong Kong/HKG in 2008 with Andreas Helgstrand. Fasino is stationed at Deckstation Paul Schockemöhle in Mühlen.